Marine ecologists at Oregon State University have shown for the first time that tiny fish larvae can drift with ocean currents and "re-seed" fish stocks significant distances away  more than 100 miles in a new study from Hawaii. "We already know that marine reserves will grow larger fish and some of them will leave that specific area, what we call spillover," said Mark Hixon, a professor of marine biology at OSU. "Now we've clearly shown that fish larvae that were spawned inside marine reserves can drift with currents and replenish fished areas long distances away. "This is a direct observation, not just a model, that successful marine reserves can sustain fisheries beyond their borders," he said. "That's an important result that should help resolve some skepticism about reserves. And the life cycle of our study fish is very similar to many species of marine fish, including rockfishes and other species off Oregon. The results are highly relevant to other regions." The findings were based on the creation in 1999 of nine marine protected areas on the west coast of the "big island" of Hawaii. They were set up in the face of serious declines of a beautiful tropical fish called yellow tang, which formed the basis for an important trade in the aquarium industry. "This fishery was facing collapse about 10 years ago," Hixon said. "Now, after the creation of marine reserves, the fishery is doing well." 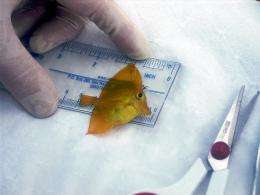 The yellow tang was an ideal fish to help answer the question of larval dispersal because once its larvae settle onto a reef and begin to grow, they are not migratory, and live in a home range about half a mile in diameter. If the fish are going to move any significant distance from where they are born, it would have to be as a larva  a young life form about the size of a grain of rice  drifting with the currents for up to two months before settling back to adult habitats. "This is similar to the type of forensic technology you might see on television, but more advanced," Christie said. "We're optimistic it will help us learn a great deal more about fish movements, fishery stocks, and the genetic effects of fishing, including work with steelhead, salmon, rockfish and other species here in the Pacific Northwest." "Tracking the movement of fish larvae in the open ocean isn't the easiest thing in the world to do," Hixon said. "It's not like putting a radio collar on a deer. This approach will provide valuable information to help optimize the placement of reserves, identify the boundaries of fishery stocks, and other applications." 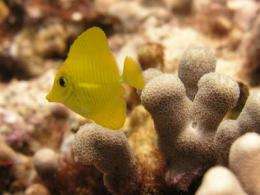 "The identification of connectivity between distant reef fish populations on the island of Hawaii demonstrates that human coastal communities are also linked," the researchers wrote in their conclusion. "Management in one part of the ocean affects people who use another part of the ocean."